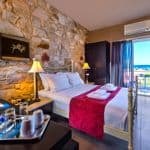 A welcoming house party atmosphere and strict singles-only policy ensure you won’t feel the odd guest out at Mistral Hotel on the Greek island of Crete. Double rooms with no single supplement, two pools, a nearby beach and on-site massages, plus activities from wine tasting to boat trips, attracts solo travellers of all ages. 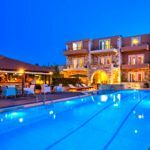 The Mistral experience is like no other – exclusively for solo travellers, we have created a friendly, welcoming and comfortable family-run hotel on the beautiful island of Crete. Attracting guests from their 20s through to their 70s, the atmosphere is inclusive and relaxed with authentic Cretan hospitality, cuisine and natural beauty. All of our 35 guest rooms are light, airy and packed with Cretan character – all have a double bed, balcony with a pool or sea view and en suite bath (Deluxe rooms) or shower room (Superior rooms). The circular bar tends to be the social hub, with music after dinner, and there are two swimming pools, a Jacuzzi and gorgeous terraced gardens. Maleme beach is just 3 minutes’ walk away. 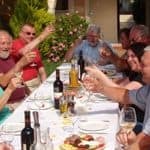 With the exception of one dinner when guests generally visit a local taverna, breakfast and a four-course dinner with wine are included each day with delicious Cretan dishes, created from local produce, mostly grown or raised in our own gardens. Whilst holidays at Mistral are entirely unstructured, we do organise some optional local excursions and activities – from cookery and wine-tasting to watercolour painting classes, boat trips to a walk through the impressive Samaria Gorge. Back at the hotel, we have an outstanding holistic therapist who offers superb aromatherapy and Shiatsu massages. We’re open from mid-April to mid-October with some special themed weeks on certain dates such as Greek Easter, walking and culture & spring flowers holidays. Chania is the nearest airport (transfers on Tuesdays are included in the price). Find out more about the hotel, our prices and people.